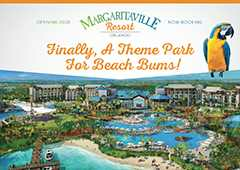 Margaritaville Resort Orlando is a new resort that is being developed in Kissimmee, Florida. The resort is set on 300 acres and is scheduled to open in 2019. It will feature a hotel and 1000 vacation rental cottages to host guests. The resort will also feature an array of guest amenities, a water park, and retail center featuring dozens of restaurants and a movie theater. MRO has licensed the use of the Margaritaville name and brand for the purposes of this resort. MRO approached Concept Farm while in the preliminary stages of resort development and engaged CF to handle all marketing of the resort, working closely with both the resort developers and Margaritaville corporate marketing team to assure the resort was presented in an exciting manner that was also consistent with the parent brand. Overall, our objectives were to deliver quality leads for cottage sales and to build a pool of potential renters to occupy the rental units and hotel once the resort opened. The goal of this ad was to announce MRO to all the advanced planners that use the annual magazines put out by Visit Orlando and Experience Kissimmee. Visit Orlando distributes their annual Official Visitors guide to 800,00 consumers. Experience Kissimmee distributes their annual Destinations magazine to over 300,000 consumers. Based on a mix of the distribution and the selling points of MRO, we targeted women aged 25-54 with children and a HHI of $75K+. The decision to proceed with print ads in Visit Orlando and Experience Kissimmee's publications was the result of extended work sessions with MRO and each of the tourism boards. Following those meetings, we were equipped with binders worth of research and findings. This data helped us better understand the audience and informed all resort communications, extending far beyond this single print ad. The key message was to introduce MRO as a new, one-of-a-kind escape in Orlando. We wanted to encourage people to learn more and book their future stay using the resort's website. Traffic from the magazine and extensions of the buys with Visit Orlando and Experience Kissimmee have lead to a steady flow of traffic to the MRO website. These two print ads served as the only non-social paid media driving traffic to the website, which has gathered over 35,000 leads. The annual distribution and mailing of these publications to interested audiences have helped increase awareness for the resort. At this time, because booking has just opened, it is not possible to quantify the effectiveness of the ads beyond general awareness and lead generation.